June 1908 lawn party and fundraiser on the still pastoral Heights. Photograph: Courtesy John J. Burns Library Archive. Click to enlarge. This is the second of three articles by Professor James O’Toole highlighting defining moments in Boston College’s history as BCM observes the 150th anniversary of the University’s founding in 1863. The first article, “Class Warfare” (Winter 2012), recounted the curriculum debates that ensued when, as the 20th century dawned, Harvard University Law School declined to recognize the Boston College degree. 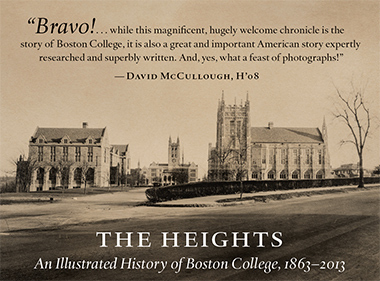 Along with details of the University’s coming celebrations, that story is featured at the Sesquicentennial website at www.bc.edu/150. Gasson’s reputation had been building locally for some time. He had served on the Boston College faculty for a dozen years, an unusually long tenure given the Jesuits’ regular reassignment of personnel. Since 1904, he had also been one of five trustees of the college, which was then located in the cramped and deteriorating South End section of Boston. By dint of personality (“he worked avidly, rapidly, always,” a colleague recalled), Gasson seemed well-suited to move Boston College forward. That would include, as it turned out, moving the school westward—from Harrison Avenue, where the college students shared a single classroom building with younger scholars alongside the Jesuit-staffed Church of the Immaculate Conception—to the high ground of Chestnut Hill. After study and teaching in Baltimore and New York, Gasson concluded his training at the Jesuit seminary in Innsbruck, Austria. Few Americans were chosen for this placement, and his selection signals an early judgment by his superiors of his promise. After ordination, he returned to America and joined the Boston College faculty in 1894. His instructional duties were typically broad for the times: rhetoric and German, philosophy and elocution, eventually political economy and law. On and off, he oversaw the small school library (as much as anyone did). It was Gasson’s presence on the Boston lecture circuit that secured his reputation outside school walls. At the end of the 19th century, public lectures were a popular form of entertainment. In addition to making regular appearances at the Young Men’s Catholic Association, Gasson was a favorite at the Boston Public Library and at the Ford Hall Forum, a Yankee institution on Beacon Hill with claims to being the oldest continuous public lecture series in the country (it still exists). Gasson’s themes could be secular or religious; his lecture on “Socialism,” in particular, prompted calls for repeat performances. Unprepossessing, (he had a “short stubby body,” one candid friend wrote), Gasson could command an audience. He was a man of “almost unthinkable” energy, a contemporary observed. He enjoyed give-and-take with his listeners, and once challenged three visiting Methodist ministers who insisted that the Bible had to be the sole guide in religious matters. As the incident is recounted in an obituary, Gasson demanded to be shown where in Scripture it said that only arguments from Scripture were acceptable. Gasson was a driven man, hard on himself and exacting of others. In that, he was not unlike John McElroy, SJ, founder of the college in 1863. A priest friend recalled of Gasson, “Labor was his life.” Another noted, “neither his comfort nor his health was of importance” to him. When the bell sounded at the end of the class day, it did not necessarily follow that his class was dismissed yet. Sometimes, his big ideas threatened to run away with him. Given the expense, it was probably for the best that the college did not attempt to open a medical school, as he hoped. Still, his vision and vigor would transform Boston College. Where the college might go, Mullan couldn’t say. For the time being, he reallocated space in the South End building so that the high school and college programs occupied different corridors and their students used separate entrances. This brought some relief, the editors of the college’s student newspaper Stylus said: “The collegian may now walk forth in the calm of manhood without fear of being hustled about by our small boys.” In 1904, the first high school graduation ceremony independent of the college took place. The city’s South End had built up rapidly since Boston College’s founding in 1863, and the results were not always welcome. Townhouses intended to attract the well-to-do became rooming houses for a transient population. Back gardens designed in imitation of fashionable London were filled in with flimsy outbuildings. A guidebook for visitors to Boston in 1903 disparaged the neighborhood as “a faded quarter” with a “seen-better-days” air. Installment stores moved in, selling household items and clothes on credit. “Sneak thieves in church,” a Jesuit at Immaculate Conception wrote in his diary one day in 1907; “four boys; pocketbooks stolen at late Mass.” Another day brought a different petty crime: “Wine cellar broken into between 4 + 5 a.m., two boys caught before 6:30.” What’s more, the Jesuit residence was now half a century old and in need of constant repair. Complaints were frequent (“kitchen sinks clogged + overflowing, the odor rising to the heavens,” a resident recorded one day). An attractive parcel of land in Brookline caught Gasson’s attention in early 1907, almost immediately after he became president. “Beautiful Brookline” (as residents and non-residents alike called it) was an independent town that had recently resisted an effort by Boston to absorb it. The property Gasson looked at was undeveloped—owned by the prominent Sears family in what was called the Cottage Farm neighborhood. Situated just west of Kenmore Square, Cottage Farm nestled in an angle formed by the convergence of Beacon Street and Commonwealth Avenue, adjacent to a district subsequently known as Longwood. As a site for the college, the Sears property offered a key advantage. It was not far from the original buildings on Harrison Avenue and thus represented no great change in the mental geography of the school. But there were disadvantages, too, beginning with the price, more than $750,000. Gasson also worried about “the swampy nature of the soil” and the “railroad which fringes the property.” He decided to look elsewhere. Next to be considered, Gasson recalled later, was “a large property . . . on the outskirts of Watertown, known as the Cassidy estate,” a wedge of land along the Charles River adjacent to a working federal arsenal. This land too was swampy and pricey (though Gasson did not specify a cost). Moreover, it was located not far from St. Patrick’s Church in Watertown. Pastors of the era jealously guarded their flocks, and there was some concern that a college chapel might siphon off parishioners. Archbishop William Henry O’Connell, who was advising Gasson both as a Church leader and as an alumnus (Class of 1881), was unlikely to approve any site that posed this threat. Thirty acres on the north side of Commonwealth Avenue in Brighton, the site today of St. Elizabeth’s Hospital, next caught his eye. This was “a splendid plateau, from which a delightful view of the entire surrounding country could be had,” and the land drew Gasson back for repeated visits. But when he presented the idea to O’Connell the prelate rejected it. St. Columbkille’s parish in Brighton Center was less than a mile away, posing the same difficulty as the Watertown location. “His Grace could not be moved from this position,” Gasson later wrote resignedly. Few Massachusetts families were more accomplished than the Lawrences. Three brothers—Amos, Abbott, and William—had been at the forefront of the revolution in textile manufacturing early in the 19th century. In the 1840s, they and their associates founded the city 30 miles north of Boston that bears the family name and that, with neighboring Lowell, became for a time the epicenter of American industry. In the next generation, family members turned to philanthropy and public service, with Amos Adams Lawrence (son of the original Amos) standing out as a committed abolitionist. As the controversy over slavery mounted in the 1850s on the Kansas and Nebraska frontiers, he paid the moving expenses of “free-soil” settlers; a city in Kansas bears the family name as well. To help the settlers ward off their pro-slavery neighbors, he provided guns, some of which wound up in the hands of John Brown, the radical abolitionist (then in Kansas), who may have used them in his attempt to free slaves in Virginia a few years later, helping to ignite the Civil War. In 1862, Lawrence acquired a farm in Chestnut Hill to which he, his wife, and seven children could retreat from the increasingly crowded city. This was a gentleman’s farm, but it was also a working agricultural concern. Lawrence, a son recalled, found relief in “superintending the plowing, sowing, and reaping, planting nurseries of fruit-trees, pruning and grafting, overseeing the dairy.” A main house was built, and there were various barns and sheds, together with a small workman’s lodge constructed of stones from the colonial mansion of John Hancock on Beacon Hill (which had been taken down in 1863). The original farm was more than 100 acres, but the city took the eastern part of it in the late 1860s to build the second of two reservoirs for the expanding metropolitan water system. The family complained that this loss “deprived it of its bucolic aspect,” but what remained was bucolic enough. Occupying a sloping plain behind a steep rocky ledge, the site had a view toward the city across the reservoir (called, appropriately, the Lawrence Basin) that was practically unimpeded. Seen from town, the land was almost the highest point for miles around. Beacon Street marked one boundary of the farm as it continued unbroken from Boston into Newton; developers hoped eventually to divide the land across Beacon into house lots. On the other side was an extension into Newton of Commonwealth Avenue, and here, too, the adjacent land was largely undeveloped. A small cemetery fit between the road and the reservoir on the Boston side of the line, and in 1880 Archbishop John J. Williams purchased the Stanwood Estate across from it for his new diocesan seminary. After Amos Adams Lawrence’s death in 1886, the family began to think about selling off some of the farm. Most of it was sold right away to a banker named Sylvester Hinckley, who subsequently went broke, and several efforts were made to subdivide and develop it. One proposal called for a network of four streets and 50 house lots, to be laid out in the area that comprises today’s Middle Campus. With the ups and downs of the real estate market, plans for the site were never realized, and the land was still open and available when Gasson started looking for a new home for his college. Private negotiations continued through the summer with the provincial and with O’Connell. When all the approvals were in hand, Gasson made the news public. “New Home for Boston College in Newton,” the Globe‘s headline read on December 19. The deeds had been executed and filed the previous day. “The site is one of the finest in New England for college buildings,” the paper opined. 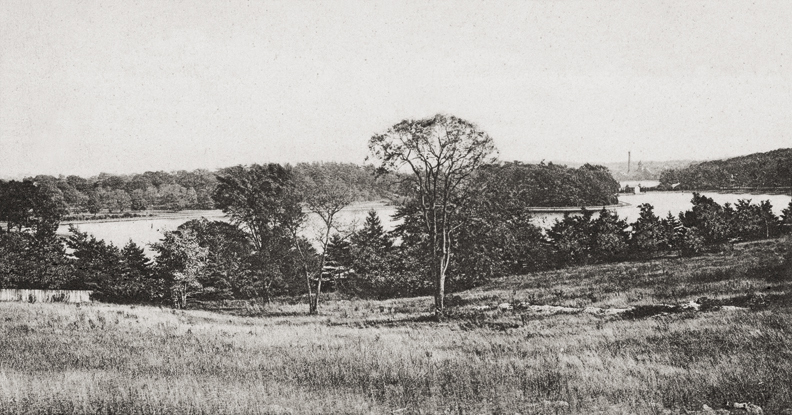 Undated view of the upper reservoir (now lower campus), from what is now middle campus. The remaining reservoir and the waterworks building on Beacon Street can be seen in the distance at right. Photograph: Courtesy Andrew Nelson Collection. Click to enlarge. In acquiring the land, Gasson had committed to paying more than $260,000. Various stocks and bonds in which the school had invested over the years were liquidated. Several private houses that had been bequeathed to the Jesuits by sympathetic supporters—mostly located in the South End, but one of them (“a constant source of expense”) in Pawtucket, Rhode Island—were similarly sold off. Short-term mortgages on the existing buildings (the classroom facility, the Jesuit residence, the church) were negotiated and renegotiated. The lion’s share of the down payment came from the estate of Edward Holker Welch, SJ, the last of the original five incorporators of the school in 1863, who had died three years before. Welch came from a family of successful lawyers in Boston; after graduating from Harvard, he had converted to Catholicism and then joined the Jesuits. A legacy from his father had grown to more than $100,000. But more funds were needed. Gasson “preached at most of the masses in behalf of the New College,” a diarist at Immaculate Conception Church noted early in 1908. Contributions, most of them $10 or less, came quickly and were recorded in an account book that Gasson kept in his own hand. “Mrs. Mary Dyer,” described by the president as “a poor widow, then living at 716 Harrison Avenue,” gave the first dollar. In 1908, more than $26,000 was raised in this way, from nearly 2,000 separate benefactors. “Whoever contributed one dollar,” Gasson explained, “received a card to the effect that the said giver had donated one foot of land to the new college; to those who gave more than one dollar, not a card, but a small document was given, testifying that they had donated as many feet of land as they had given dollars.” Modern methods of fundraising were in their infancy, but Gasson seems to have had a natural affinity for them. Current students also contributed. In January 1908, for example, a Jesuit at the college presented three dollars—one each from his students Joseph Duffy, Samuel Malone, and David Lane—and two days later he passed along three more dollars “from other boys, names not given.” The devotional sodalities of Immaculate Conception Church joined in: $35 from the married men’s group, $100 from the young men’s group, and $16 from the sodality for young women. Several temperance societies, whose members took the lifelong pledge to abstain from alcohol, pooled their contributions, amounting to $159. The mother of Fr. John Butler, pastor of a church in suburban Weymouth, sent in $40 “on account of his fortieth birthday.” Gasson recorded $5 from “Kathleen Meehan (deaf mute child)” and 25 cents from an unspecified “poor boy.” One woman sold off an heirloom pocket watch, and the college realized $114 from the transaction. Margaret Kelly, identified only by her name, set herself the goal of assembling “a mile of pennies,” and over the course of a year sent in $67.33. With the coins laid flat, that sum would have stretched to a mere 421 feet (or so), but one imagines Gasson making much of her efforts. Slightly more than half of the individual contributors were women. None of them could yet attend Boston College, and there was no thought whatever of admitting them. Still, Boston’s Catholic women supported the school in the hope that it would continue to benefit their brothers and sons. When summer came, the land itself was used to elicit support. At the end of June in 1908, alumni and friends were invited to the property for a “reunion and field day,” the climax of which was a formal dedication ceremony. An “immense throng,” estimated by the Globe at 25,000, showed up to enjoy carnival rides, vaudeville shows, and games of chance, the proceeds of which were devoted to the college’s cause. At the end of the afternoon, Gasson introduced the featured speaker, Bourke Cockran, a Catholic congressman from New York whose oratorical skills were said to rival those of William Jennings Bryan and who delivered a long address in praise of Jesuit education. In his own remarks, Gasson referred to the property (apparently for the first time) as “University Heights,” and the name would stick. The evening concluded with fireworks. “Having reduced the debt on the land,” Gasson wrote, “we began to devote our energies to the raising of a fund for the building.” But in fact Gasson had an additional item on his agenda: redrawing the boundary line between Boston and Newton. The postal address of the Lawrence farm was Chestnut Hill. This was not an official town entity; rather, it was an informal district that straddled the border of the two municipalities. Most of the new campus lay on the Newton side of the line, the “suburbs,” as Gasson had noted. Hoping to retain the close identification of the college with the city, he submitted a petition to the Massachusetts legislature to adjust the border so that the campus would be entirely within the limits of Boston. “All the traditions of Boston College are connected to Boston,” he told a newspaper reporter, and he maintained (not entirely correctly), “Existing boundary lines between the two cities are indistinct.” A bill was filed, and early in 1910 Gasson attended a hearing at the State House at which Newton officials voiced their objections. If the plan went ahead, they testified, Newton would not be able to widen Beacon Street or South Street (later called College Road), and each of those projects was “a necessary improvement.” At the same time, the suburb would have to maintain other roads in the area, all “for the benefit of this territory” that would no longer belong to it. Considerable expense had already gone into constructing drainage and sewers, and if the land went to Boston, Newton would have essentially given the metropolis those services for free. The bill was given “leave to withdraw” from the legislature without being put to a vote. It was a rare occasion when Gasson, who also testified, lost a debate. In the fall of 1908, Gasson went on a tour through “most of the leading colleges of the south and west,” as he recounted it, to inspect their architecture. This was an era of extensive construction on American college and university campuses. Schools everywhere—public and private, old and new—were beginning to think about the aesthetic their buildings and green space presented to the world. Woodrow Wilson, then the president of Princeton, was remaking his campus into what he called a “little commonwealth of our own.” Closer to home, Harvard was reaching beyond its “yard,” aggressively buying local property in pursuit of what one scoffing alumnus called a “constructed utopia.” Gasson returned from his trip reportedly impressed with the collegiate gothic architecture and campus of the University of Chicago, built (mostly with John D. Rockefeller’s money) over the preceding decade. He continued to visit the property at the Heights regularly, sometimes bringing students along as a way of sustaining their enthusiasm. On one occasion, playing to this audience, he announced that “a modern gymnasium” would be “one of the first structures,” although that was never his intent. There were few Jesuit traditions in America pertaining to campus architecture. The Society’s institutional buildings generally took such style as they had from whatever local designers were available. Knowing that the commission to build the new Boston College might be a very lucrative one, Gasson and the trustees decided to open it to competition. A committee of four Jesuits (including J. Havens Richards, SJ, the former president of Georgetown) was appointed, joined by four local professional men. These latter included an architect (who took himself out of competition), a building contractor, and a landscape architect who had previously worked with Frederick Law Olmsted. Together they drew up a 20-page prospectus, “Arrangement of Buildings and Grounds for Boston College.” Gasson was new to this business, and sometimes it showed. After sending a preliminary inquiry to one potential applicant, he got a starchy letter in reply. “The best architects,” this principal at the Boston firm of Peabody and Stearns told him, expected a small fee in advance—or else they would be investing their time and money on “the hope” of a win, as on “a horse in a horse race.” The committee agreed to pay $250 (later increased to $300) to invited competitors. The winner would receive $1,000 and, more importantly, the right to go ahead with the project. The Maginnis and Walsh grand plan, 1909. Commonwealth Avenue is at right. Present-day College Road appears near the top. Photograph: Courtesy John J. Burns Library Archive. Click to enlarge. The prospectus described a campus of interrelated buildings, but the focus was to be initially on a “Recitation Building.” The name says something about how teaching and learning were expected to proceed at the college: Students would be presented with their lessons, and they’d be required to recite them back. This central facility, three stories high, was to have 10 classrooms capable of seating 40 students each, and three more that could hold 70. Three assembly halls were included: a large one with movable seats on the first floor (“the main feature of the plan”); a smaller one “to be used for debating societies, etc.”; and a third “with benches, after the manner of a Senate Chamber.” (This last was probably intended to resemble the British House of Commons, with benches facing off along two opposing walls.) A library with shelf space for 10,000 volumes was featured and, adjacent to it, four rooms where “teachers rest between class exercises.” Anticipating the winter months, there would have to be some kind of coatroom for the students, though “the Trustees express a preference for the locker system.” Finally, there would be three offices with attendant waiting rooms, for the president, the prefect of discipline, and the registrar; the president’s office would have a fireplace. Toilets, janitors’ closets, and other practical necessities would have to be factored in. The Recitation Building was to be just the beginning. Other edifices “will probably be built within the next two years,” and still others “from time to time as funds are available and as conditions require.” A “Faculty Building,” for instance, would be needed sooner rather than later so that the Jesuits would not have to commute daily from their residence in the South End. A free-standing library was described, capable of holding 200,000 volumes but expandable to three times that number; it would be “open to all students, all members of the Faculty, and for the public in general with some restrictions.” Additional classroom buildings might include a “Hall of Philosophy,” together with separate buildings for chemistry, physics, and biology, each with laboratories. Six “houses of retreat” were called for, each to hold 100 students. The intent of these is unclear. They may have been for use during the two- and three-day religious retreats that were required of students, or they may have been meant for longer residencies. To fulfill the college’s religious needs, there would be a chapel in the faculty house; a separate student chapel (“without ‘luxury of space’—The services will be relatively short”); and a larger church building, open to the general public and seating 1,500. This might best be located, the planners thought, on “the margins of the property, by which the public may enter freely without trespassing too far within the precincts of the College.” Finally, there would indeed be a student gymnasium (“Use Brookline Gymnasium as a model”) with an elevated running track, a “swimming tank,” and six bowling alleys. This would be adjacent to an athletic field with a quarter-mile oval, a football field, a baseball field (“carefully placed with regard to sun”), 10 tennis courts, and grandstands for 10,000 fans. The specifications were distributed in early January 1909, and submissions were due by mid-March, with a decision to be announced a month later. At least one applicant thought the timing “rather short,” considering “the season of the year which does not admit of too intimate a survey of the site.” Even so, 13 proposals came in, and on April 12 the judges made their decision: A relatively new firm, Maginnis and Walsh of Boston, took first place. The firm’s senior partner, Charles Donagh Maginnis, an immigrant from Northern Ireland, had worked on a number of Catholic church and chapel commissions. In 1899, he won the commission for the chapel at Saint John’s Seminary in Brighton. He had some strong ideas about how religious structures should be adapted to the American context: Not every local church, he held, had to look like Chartres. The firm he formed with his friend Timothy Walsh in 1905 would became the country’s foremost designer of church-related facilities in the first half of the 20th century, with collegiate commissions at Holy Cross, Fordham, Notre Dame, and elsewhere. In this “early 20th-century” view shot by professional photographer Clifton Church, the Recitation Building stands alone. Photograph: Courtesy John J. Burns Library Archive. Click to enlarge. Although virtually none of the winning design was ever built as planned, Maginnis’s vision established expectations for the campus among alumni, students, and friends of the college over the succeeding decades. His design covered the entire property, north to south (Commonwealth to Beacon) and west to east (present-day College Road to the cliff). In it, a main gate led from Commonwealth Avenue to the Recitation Building (what now is called Gasson Hall), which, on paper, was shaped like a fat H and was surmounted by a low stump of a tower. Both sides of the entering roadway were crowded, with two buildings to the right and four to the left, one of them a massive public church. Additional structures were fitted between the Recitation Building and the athletic fields, which hugged Beacon Street. A landscaped plaza east of the Recitation Building extended to the cliff edge, offering a view of the city. The unifying style was collegiate gothic. Ground was officially broken for the Recitation Building on June 19, 1909, a Saturday. The Boston Herald reported that from noon until nearly midnight, an estimated 30,000 people flocked to the property. 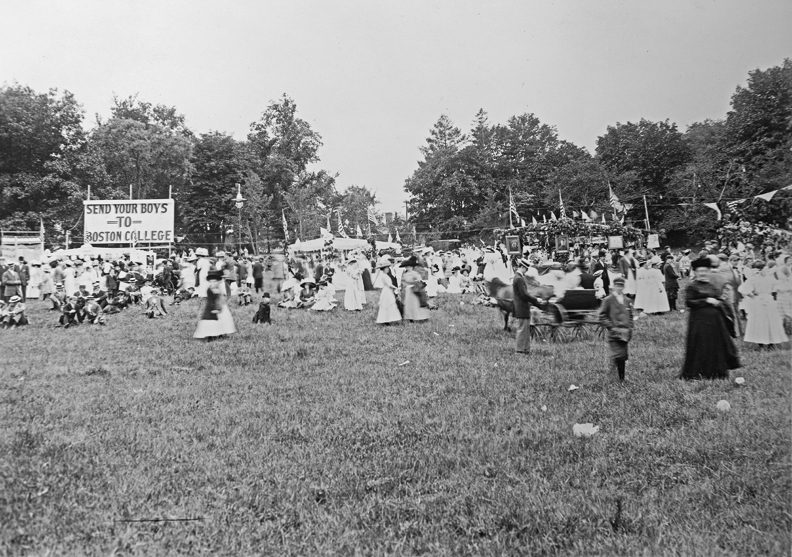 Similar to the garden party of the year before, this event featured rides, games, music, fireworks, and, as a special draw, according to the Globe, “exhibitions of . . . skill” by “a group of Indians and cow boys from the 101 Ranch Wild West Show.” At the end of the afternoon, the formal ceremony began, and the Globe noted its “purely civic character” (meaning there was no Mass or religious service). A professor from the University of Notre Dame delivered a salute to Jesuit education. Edward Burns, an alumnus of the Class of 1880, read “Our Mother’s House,” a poem he wrote for the occasion. Then Gasson stepped forward carrying a shovel adorned with ribbons (red, white, and blue; maroon and gold). “The sod was tough from the trampling of many feet,” a reporter wrote, and Gasson “had to take off his cuffs and stop to wipe his brow several times,” playing, perhaps, to his audience. Other dignitaries took their turns, including the mayors of Boston and Newton. At that moment, Gasson and his fellow Jesuits probably did not appreciate how much money would be needed to erect the first building (more than $200,000), or how long the construction would take. As before, their fundraising plan relied on amassing small contributions, a method that took time. Money was often tight, and with “frequent delays in the shipment of building material,” reported the Stylus, progress was slow. Several times, the project came to a halt. The initial design was scaled back and the building’s footprint shrank, though its tower was raised to a more impressive height. All the while, photographs of the construction site ran regularly in the Stylus and in local newspapers. 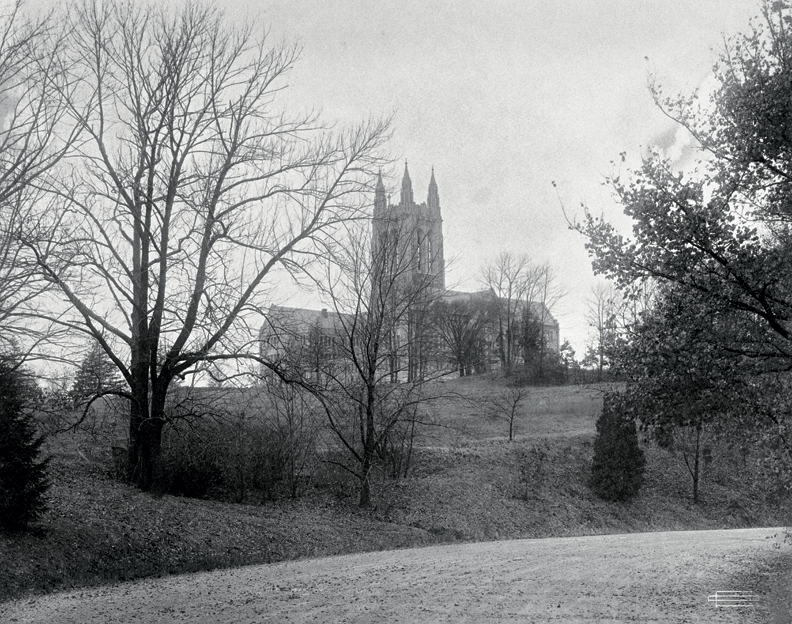 In May 1910, students expressed their hope of attending classes at Chestnut Hill by the start of the 1911–12 school year, but that did not happen. By September 1912, a finished building seemed at last in sight. “Everything points now to the possibility of transferring the classes [to the new location] shortly after Easter,” a student wrote in Stylus. The windows were in place, and interior decoration was underway. Francis Schroen, a Jesuit brother whose murals adorned the walls of Georgetown, Fordham, and other Jesuit properties (including the original school building in the South End), was busy painting in the main assembly hall and the adjacent rotunda. Blackboards had been installed, and the debating room on the third floor was ready. The occupation: In late March 1913, seniors converge on what they will informally call “the tower building.” Photograph: Gary Wayne Gilbert, courtesy John J. Burns Library Archive. Click to enlarge. On Friday, March 28, 1913, a sizeable contingent of the 43-member senior class “occupied” (as they put it) the building. “New College informally opened,” a Jesuit chronicler recorded tersely that day, noting that Gasson and members of the faculty “went out, met the students (senior)” at Chestnut Hill. Gathering in the South End, the students had taken the streetcar to its terminus near the reservoirs and then marched up the hill. Accompanied by Gasson, they entered the new building. “Members of the class of 1913,” Gasson proclaimed, rising to the occasion, “we now, in an informal way, take possession of this noble building, for the greater glory of God—for the cultivation of true knowledge—for the development of general science—for the constant study of those ideals which make for sound personal integrity and for lofty civic uprighteousness [sic].” The date was significant—just four days short of 50 years after the governor had signed the legislation incorporating Boston College. The students fanned out through the building, examining it from top to bottom. They were permitted to choose a classroom that would be theirs, and they selected “a big, sunny room” on the southeast side. “Classes went on,” the Jesuit chronicler noted. William Brett, SJ, conducted his lesson in ethics, and afterward classes in psychology and theology resumed where they had left off in the South End the day before. Instruction for seniors continued in the new building until the end of the year, though some adjustments in the schedule were needed. Equipment for the small chemistry lab had not yet arrived, so students had to return to the old school building one day a week for their experiments. By the time of the formal cornerstone ceremony on June 15 and the first Commencement exercises on the grounds, June 18, the faculty and seniors had taken full possession of the new campus. Starting the following September, all college-level classes were conducted at Chestnut Hill. Thomas Gasson would not remain at Boston College to see more campus buildings constructed (St. Mary’s Hall in 1917, Bapst Library in 1922, Devlin Hall in 1924). He left Boston in January 1914, bound, according to one Boston paper, for “the Society’s rest-house” in Maryland. Later, assignments would take him to Georgetown University, to Rome, to a retreat house on Staten Island, and to Loyola College in Montreal. He was 70 years old when he died in that city, in 1930. “It was the boast of Augustus,” a Jesuit eulogist wrote, “that he found Rome brick and left it marble.” Fr. Gasson, the remembrance continued, “found Boston College a dark, uninviting building, in an obscure location, little more than an appendage of the Church of the Immaculate Conception.” He left it with one grand building, plans for more, and expectations of a campus that would “be unrivalled.” One suspects that Gasson would have enjoyed being likened to a Roman emperor. James O’Toole ’72, Ph.D.’87, is the University’s Clough Millennium Professor of History and the author of The Faithful: A History of Catholics in America (2008). He is currently at work on a book-length history of Boston College.